Suzy is the Founder of Soul Reflexions and has been pampering loyal clients for the past fifteen years. She received her training in both South Africa and Canada and is a certified Body Worker, Reiki Master, Crystal Therapist, Reflexologist and Eminence Organic Skin Care specialist. All of her holistic treatments are highly personalized and effective in ensuring you achieve ultimate rejuvenation and pampering. 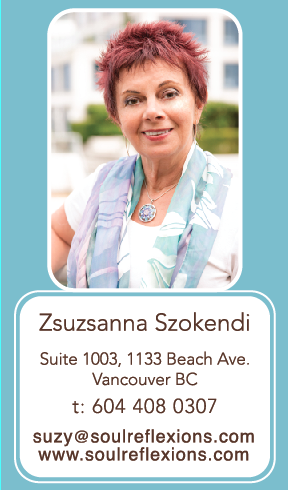 Suzy understands the time constraints and stress levels that many clients face on a daily basis. Not only does she provide a very safe, tranquil and nurturing environment but you can enjoy the flexibility with your schedule. Call 604.408.0307 or email today to indulge in a personalized combination of treatments for your body, mind and soul.